Caught Herring under lights before daylight, picked up clients and caught gizzards and went fishing. Ran mouth of creek with 10' flats nearby , had a couple of hits . Moved to 8' flat and ran planner boards and started putting fish in the boat , mostly on Gizz. After the sun got bright we moved to 20 ' flats and continued to catch fish. 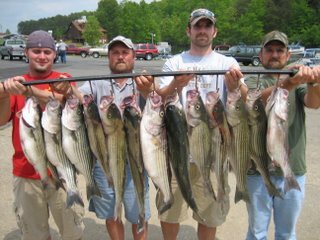 Had 30 hits, clients kept 15 stripers for 78 lbs, 3 catfish.